No, I haven't stopped blogging about gaming. I've been playing, but away from the casa. I generally don't write anything if the host also blogs about gaming. A couple of weeks ago, I threw Space Crusade on the table, yet failed to post anything about the evening. That was my laziness at play and the fact that I didn't get any pictures of the game 'in action'. 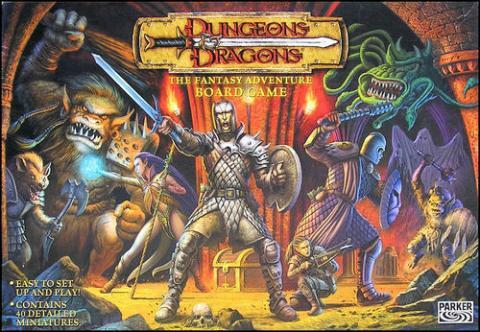 This week, I hosted an evening of Dungeons and Dragons: Fantasy Adventure Board Game. While I didn't get any pixels of the game (I don't like taking pictures of games that involve miniatures that should have paint on them, but don't. If you want pictures, check out the included link to the game's BGG page. There are scads of pics that would trump anything I could shoot), I did want to discuss this game both in relation to its older brother HeroQuest and how this game fares as a dungeon crawler. "Why?" you ask? It's simple, really. This game was not released in the USA and has little presence stateside. Copies of it pop up every now and again on eBay, but not very often. Note - The photos on this page are from BGG. Those of you that are familiar with D&D and other dungeon crawlers understand the premise behind these games: Adventurers delve into a plot, usually with an objective to accomplish and in the process of achieving said objective, kill monsters, step in/find/remove traps and gather treasure like a squirrel collects nuts. In the case of this game, all of this is done, but without all the messy 'role playing' that goes along with the process. It's a board game, remember? So how does this compare to HQ? Well, they both play 2-5 players and manage to cover all the standard fantasy tropes. In HQ, you have a warrior, a dwarf, and elf and a mage. The mage or elf can double as a cleric for the group, but in a very limited capacity. Instead, you have to rely on potions to heal. The dwarf serves as the 'trap guy', but with more fighting ability than a typical thief. There isn't any leveling up of characters within the game, but equipment can be upgraded between adventures, if you gather enough gold from treasure chests. Overall, the characters are static and are truly disposable. If someone dies in an adventure, the rest of the party is more worried about his gear than the actual character. In D&D, you have a fighter, a thief, a cleric and a mage. They 'go up' three levels, but only because the adventure tells you whether it's a level one, two, or three affair. Each level for a character offers a different equipment and spell 'load out' as well as an increase in hit points and spell points. Speaking of spells, they are handled differently in D&D than HQ. Instead of playing a one-shot spell card, you spend magic points. 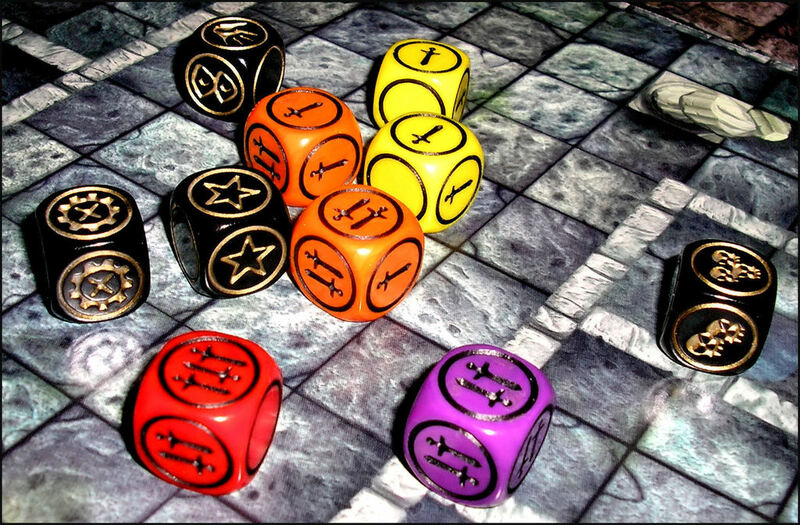 Characters can gain back spell points by using their weapons and rolling a star on a special die during their attacks. Pretty nifty, really. Another area of difference is initiative. In HQ, the adventurers all go in a certain order, then the DM goes. That's it. In D&D, every time you open a new door, the initiative is reorganized for that room via random card draw. It keeps players and the DM on their toes, as you never know when you'll be going. This makes the game more strategic than HQ. Weapons dice offer yet another change between the games. In HQ, better weapons = rolling more dice. These dice are all the same, so in essence it's 'more of the same'. In D&D, the more powerful the weapon, the better the dice used. Basic weapons usually roll yellow dice, which can inflict a maximum of one point of damage, 67% of the time. The best weapons can hit for three points of damage 33% of the time and two points the remaining 67%. There are also Power Attack options as well as re-rolls and other effects, depending on the weapon. This is infinitely more interesting, in my opinion. One last difference in gameplay is mission completion. If you finish your mission in HQ, you end when the last character makes it back to the stairs and out of the dungeon. You have the luxury to go back, kill any remaining monsters and mop up any loose treasure chests loitering in the back of some dimly lit room. Once you finish the mission in D&D, that's it. No more treasures to purloin or monsters to hack. It creates several moments where the party is looking at one another and weighing odds of sustained combat success versus greed. As the DM, it is hilarious to watch. All in all, I'd say the games are similar, but different enough to satisfy your fantasy itch. I think I actually prefer D&D a little more than HQ, if only due to a couple layers of slick gameplay upgrades. The leveling system is wonky, but at least it's attempted. I like the spell system better, as it makes the magic-using characters have to really work at what they're doing. Lastly, it seems a lot more balanced when playing as the DM. In HQ, the characters eventually become 'tanks' and can tromp through your adventures without worrying too much. In D&D, even a lowly goblin can give a level one party some fits. Then again, I've always preferred to make my dungeons hard, but not too hard. My RPG buddies still gripe about how hard my adventures were, but they still talk about them 25+ years later...mainly because they almost died, yet persevered. Isn't that truly what the stuff of legends is made of? As a dungeon crawler, this game falls between the ease of HQ and Wrath of Ashardalon. You can definitely see the beginnings of what current D&D board games became when playing this little gem. Similar to what Doom (which I like) is to Descent (which I didn't like...at least the 1st edition). I would put it on a par with Okko in terms of difficulty. It would be a great addition to any dungeon crawler collection and a fantastic way to introduce children to the genre. That's assuming you can find it cheaply in America or perhaps from overseas...without breaking your bank account with shipping fees. I hope you've enjoyed this inadvertently long discourse on a game I didn't take pictures of at all.